Titanic Aftermath a critically acclaimed play script in three acts by Michael Wehrli - Titanic Aftermath Titanic Aftermath is a stage play in 3 acts. CLICK HERE TO PURCHASE THE PLAY. comes in a glossy paperback format. It is printed through Create Space (an Amazon company). Click Here to purchase the Kindle e-book version of the play. 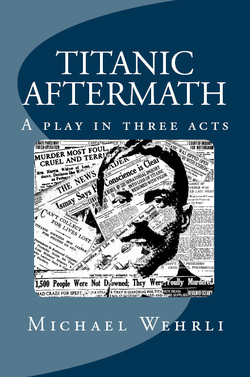 Click Here to purchase the Nook e-book version of the play. Click Here for the Kindle e-book version of the play if you live in Europe. Note: the one act version of the play is the first act. International Customers - Create Space does ship overseas. The play is also available at Amazon.co.uk. BOOK DEALERS: Please go to the Contact Us page to let us know how many books you wish to order. For high-quality Titanic Aftermath T-SHIRTS & DESIGNS CLICK HERE! For details about production rights, please go to Production Rights. Amateurs and theater professionals are hereby warned that “Titanic Aftermath” is subject to royalty. It is fully protected under the copyright laws of the United States of America, the British Commonwealth, including Canada, and all other countries. All rights, including professional, amateur, motion picture, lecturing, public readings, recitation, television, radio broadcast and the rights of translation into foreign languages are strictly reserved. Copyright (c) Michael B. Wehrli, 2000,2010 - "Titanic Aftermath"